At Paint it we do not compromise on quality. 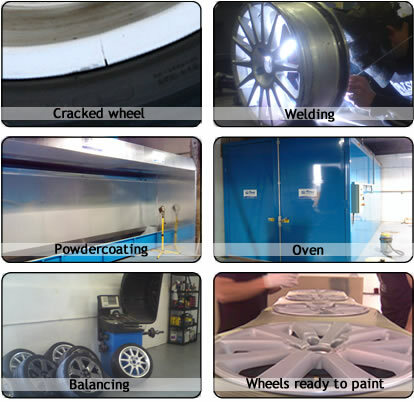 We take care in our preparation to ensure your wheels will last. We powder coat all our wheels. If they are just kerbed, in a bad way from corrosion or just having a colur change we will chemically strip, shot blast and powder coat your wheels like new inside and out back to the manufacturers original finish. This will be the closest you will get to new wheels. We have a wide range of colours including many silvers, anthracite/graphite greys, golds, shadow chrome, high power silver and even mirror chrome. In fact, if you have a colour in mind, we invite you in to choose a colour from one of ourcolour swatche. Our diamond cutting is carried out by our experienced technicians on our very own, state of the art CNC Lathe. We can also repair other damage such us flat spots from potholes, bent rims and cracks. Aluminum welding is carried out in house. 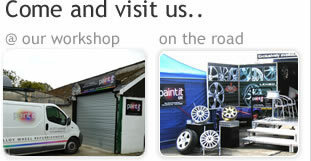 Tyre fitting is free with all wheel refurbs and all wheels will be checked and re balanced.